Curly Lace Front Wigs Q&A: Which oils are best for curly human hair wigs? "Which oils are bad for curly lace front wigs?" Instead of just outlining which oils are "bad" for curly lace front wigs, it might be more helpful to outline the oils that are good for curly hair wigs (and all textures), that way you'll know what to use instead of just knowing what not to use. Mineral oil wouldn't make the cut for our fictional list of Top Oils for Hair. The main objection to mineral oil as an all-over-hair product is that it simply coats the hair - yes it makes hair smooth and yes it makes hair shiny, but mineral oil also prevents moisture from penetrating the hair shaft which causes dryness, brittleness and breakage. We'd like to avoid hate mail from the petroleum jelly advocates by saying that most oils are fine for hair it just depends on how they are used and what you hope to gain by using them. If you want an oil that penetrates the hair to nourish it then mineral and jojoba oil aren't the best choice; but if you want an oil that sits on the surface to smooth the hair then mineral and jojoba oils are the better choices (with Jojoba being the clear winner by a mile as it works in a similar way to the natural oil (sebum) found on the scalp). The best oils to use on your curly human hair wigs (including curly lace front wigs) are essentially plant based oils and butters like almond, argan, avocado, castor, cocoa, coconut, jojoba, olive, rosehip and shea. Where possible go for cold pressed versions (as these provide the highest levels of nutrients for the hair). All of these oils penetrate the hair to some degree (with coconut oil being the best for penetrating the hair cuticle). 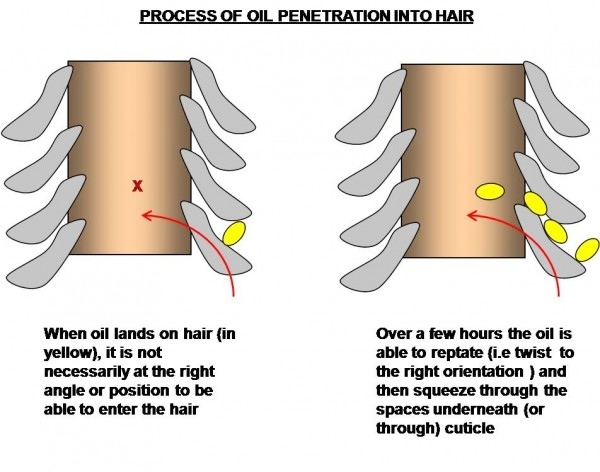 Why is oil penetration important for human hair wigs and extensions? This means your curly lace front wig will last longer. Caring for curly hair wigs by using the right oils will help preserve the curls and keep your curly hair wig looking great. "When should you use oils on my curly full lace wigs?" We find it's easiest to think about maintaining curly lace front wigs (actually all human hair wigs and human hair extensions for that matter) as three different areas; daily styling, washing and deep conditioning. Using oils on your curly lace front wig can be part of all three areas. It may seem counterintuitive but as oils lubricate, they help with detangling hair prior to washing (the hair is slippery so easier to detangle the hair curly full lace wigs). Oils also help prevent hair from dehydrating and losing proteins during the washing process, so you can apply oil (as much or as little as you like) to your curly hair wig before washing and leave it on for between 2 and 12 hours. Pre-wash oiling will also create a buffer against any harshness of the cleansing agent (shampoo). Oils help seal moisture into the hair and so you can use them as part of your hair washing routine and apply them when the hair is wet. Oils like coconut (the kind that is hard and white at room temperature - not free flowing) and cold-pressed olive oil are great for this. You should also regularly moisturize your curly lace wig (oils aren't moisturizers, they lubricate and nourish), why not check out our guide to best way to moisturize curly lace wigs. Apply a small amount of your chosen oil on the wet hair and distribute it using a wide tooth comb - don't rub or massage the oil into the curly hair as this can cause the hairs to fray and become frizzy when dry. Oils also help lubricate hair and reduce frizz, so you can also use oils as part of your daily routine to smooth and yes, shine. You'll have notice that the new kid on the block is argan oil - which contains vitamin E - it can be a bit pricey but thankfully a little goes a long way. Curly full lace wigs (and all curly human hair wigs) have usually been chemically processed for texture, so the structure of the hair has been altered. This means it can be prone to drying out - oils that penetrate the hair help lubricate and provide lost proteins which strengthens the hair and will help your curly hair wig last longer. There are lots of questions about lace wigs, so why not check out the Your Lace Wig Questions, Answered section.